The competition organised by Sunway College together with the Oxford and Cambridge Society of Malaysia (Oxbridge Society of Malaysia) saw a crowd of 820 fourth and fifth formers, accompanied by their teachers from 23 schools attending the event. 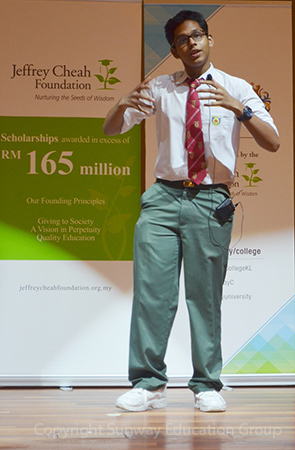 A Form Four student of SMK Kota Kemuning, Shah Alam, Ahmad Irfan’s creative view and presentation on the topic ’Traits of a Successful Individual’ which centred on his personal experience and examples as a teenager marked him as a clear and unanimous winner. Margaret Hall, Executive Committee Member, Oxbridge Society of Malaysia said his well-structured presentation with a good use of humour which connected with the audience, placed him ahead among the six finalists. Ahmad Irfan won himself a cash prize of RM600, full tuition fee waiver for any pre-university programme at Sunway College and the Champion trophy. 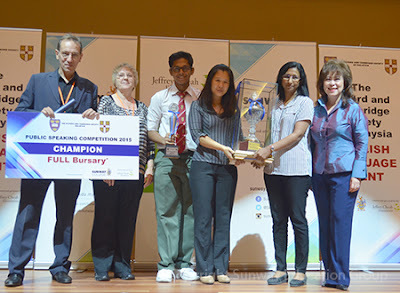 Tey Chee Horng of Kuen Cheng High School, Kuala Lumpur came in second with Ooi Gaik Teng of SMK Aminuddin Baki, Kuala Lumpur in third place. Winners of the Consolation prizes were Nileash Jeganathan and Dhiela Kuruvilla from SMK Taman Desa, and Evelynn Trish Lourdes Paul from SMK St Mary. Participants were judged on clear pronunciation, clarity of argument and analytical thinking skills. “One’s participation in public speaking competitions have been known to be a great self-esteem booster. Standing up on stage and talking to a room or a hall full of people can be a terrifying experience for some”, said Dr Elizabeth Lee, Senior Executive Director, Sunway Education Group and Sunway University. “For those of you who would like to make a difference or even change the world, do bear in mind that public speaking is an effective platform for spreading revolutionary ideas, and at the same time get your message through to people, even changing the way people think by aligning your thoughts with theirs. Many charismatic leaders have been known to be good orators”, she added. Judges for the event were Dr Ian Halsall, Honorary Secretary; Emma Davidson, Vice-President for Oxford and Mark Disney, President of the Oxbridge Society of Malaysia. The event is the 13th so far, organised by the Sunway Education Group, and the Oxford and Cambridge Society of Malaysia. The yearly event aims to be an agent of change in motivating students to appreciate the linguistic beauty of the English Language both in written and spoken form.